The One Direction star appears to have been busy since the boy band officially embarked on its hiatus earlier this month (Dec15), and has listed the tracks Already Home, Coco, Endlessly, and 5378 Miles with officials at the American Society Of Composers, Authors And Publishers (ASCAP), according to Britain's Daily Telegraph. 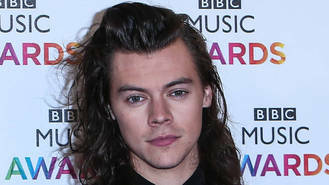 He is registered as the writer and performer of the tunes, which were filed under his full name, Harry Edward Styles, while Courteney Cox's ex-fiance, Snow Patrol star Johnny McDaid, and musician Gary Go share songwriting credits on the 5378 Miles track. The move suggests Harry is hard at work on new material for his own project, even though he recently denied claims a solo album was in the works. "We all write kind of separately and for other people," he explained during an early December (15) appearance on U.K. talk show Alan Carr's Chatty Man. Harry has yet to comment on the new song registrations, but he isn't the only member of One Direction to branch out musically - Liam Payne recently gave Irish boy band HomeTown a huge boost by penning their latest track, The Night We Met. Liam revealed his involvement with the group last week (21Dec15), when he took to Twitter to share a link to the video accompanying the song. "Hey everyone almost Christmas... listen loud and enjoy!" he tweeted.